Recently Amy's children, along with a few friends, had the wonderful experience of holding barn owl chicks. 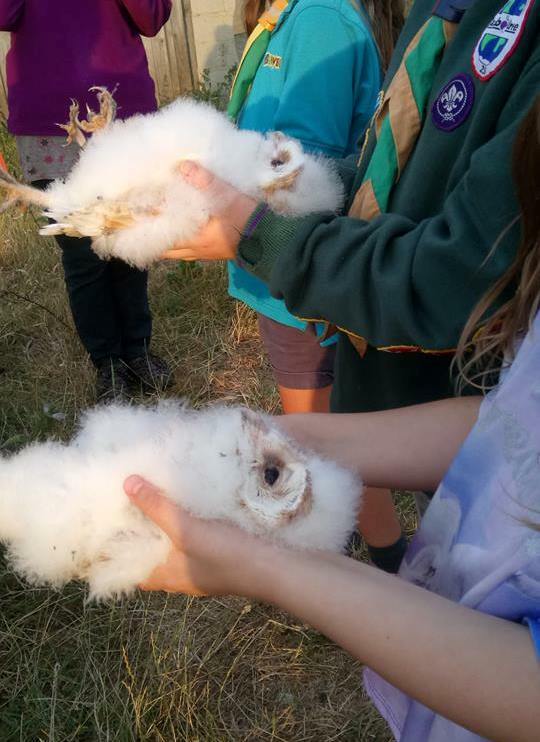 Everyone, children and parents alike, was in awe of the little fluffy bundles, now about five weeks old, and how they went in a stasis like state whilst being held on their backs as their BTO identifying rings were fitted by our local birder. 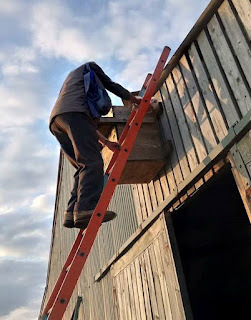 The chicks come from a nesting box fixed to the barn on a farm within walking distance of the family home. There were three healthy chicks which were checked over, ringed and returned to the box - first class carriage in a rucksack! - our birder will keep an eye on them and we all hope to see them flying around soon. Chicks being returned to their nest box. There is a disadvantage to living in the rural wilds - Goathland has no mains gas and our electricity supply can be a bit precarious at times - think snow and high winds. However, Amy's patch is even further out and the properties in the little hamlet (and that's being generous!) are beyond the reach of the mains water supply relying on springs instead, all the residents are well aware that water is a finite resource and use it wisely and the system works well with big holding tanks containing enough water to supply not only homes but farms too. But - you know what's coming don't you? - it's been so dry that the water pressure dropped to virtually non-existent and the flow from the tap was reduced to a trickle. A trek up the moor and sure enough the tank was nearly empty. Everyone on Amy's little spur has been on essential use only and making use of mains supplies from friends to fill water containers to ensure the livestock get enough to drink. As result of this highly restricted usage the tank now has a little more in it but it's still very low. Discussions are being held about the possibility of buying in a tanker load of water to top up the tank - if - and it's a big if - the tanker supply pipe is long enough and powerful enough to pump the water up hill into the tank. So next time you leave the tap running whilst you brush your teeth think about Amy and family trying to brush their teeth without using water - not impossible but almost.